GCSE Science: AQA's ISA - tables! One of the most important parts of investigative science is recording measurements clearly and accurately. This nearly always means organising results in a neat and tidy table. You are probably aware that in your ISA you need to prepare a blank table ready for use in the practical. This table should be marked by your teacher before you fill in your data. 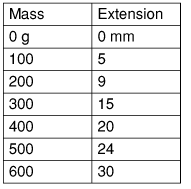 The above table has clear headings with the quantities measured neatly indicated. However, the units used are only indicated in the first row of table data. This is not accepted and is sloppy presentation. This second table is more than enough to get you full marks: the headings all have quantities and units indicated. Furthermore, the student has decided to repeat measurements of the extensions so he can take an average. Brilliant! A perfect table gives you a useful start, but there are twice as many marks for your graph. Let's move on to that: ISA Graphs.